The San Diego International Film Festival returns to America's Finest City for the 17th year this October 10-14, with a lineup filled with star-studded events and film screenings. Produced by the San Diego Film Foundation, the five-day event will feature 100+ independent films, studio premieres, panels with celebrities and industry insiders, red carpet events, parties, all-star tributes and filmmaker awards. In addition to offering promo code SDVILLE for 15% savings on any festival or film tickets, we are also raffling off 2 Festival Passes (a $700 value). Read on for all the details and be sure to enter! This year's San Diego International Film Festival will screen 115 films as well as offer a robust calendar of unique events. Screenings will be held in the historic Balboa Theater and Regal Theaters in Downtown San Diego, and ArcLight Cinemas in La Jolla. Kicking off on Wednesday, October 10 at Balboa Theater, the Opening Night Party will feature a screening of “Can You Ever Forgive Me,” which stars Melissa McCarthy and Richard E. Grant, followed by an after-party at Omnia Night Club. The complete list of 2018 San Diego Film Festival titles including descriptions are available online. Other highlight events taking place at this year's San Diego International Film Festival include the the Festival Walk of Fame Friday Night Party at Music Box in Little Italy on October 12, the Filmmaker Award Show & Party at Westin San Diego Gaslamp on Saturday, October 13, and Culinary Cinema with a champagne reception and food-focused film screening followed by a chef tasting with wine pairing at ArcLight Cinemas in La Jolla on Sunday, October 14. 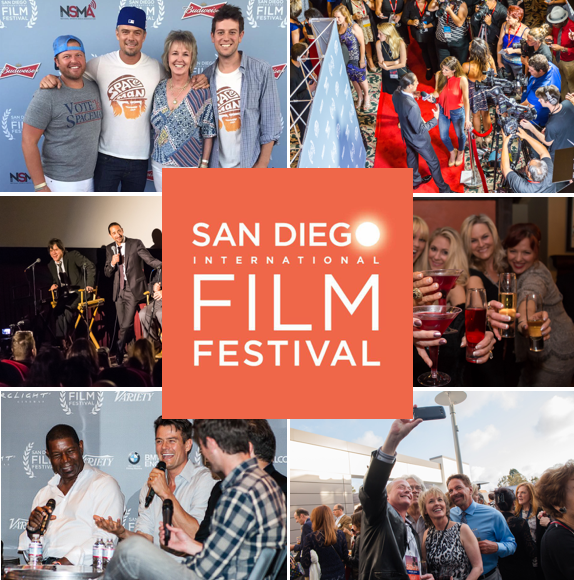 San Diego International Film Festival passes are available online for individual events and films, as well as all-access GA and VIP tickets. In addition to screenings and events, certain passes provide access to the official festival lounge and parties where pass holders interact with Festival filmmakers and professionals in the film community. Promo code SDVILLE saves 15% on any ticket type, including event passes and individual film screenings, as well as $25 off per ticket for the Opening Night Party. For more information on this year's San Diego International Film Festival and to purchase your tickets, visit sdfilmfest.com.